For many wholesalers, finding their first ever deal has been similar to looking for a needle in a haystack. However, while others gave up after a few months, today’s guest remained steadfast and focused. Eventually, he was able to close his first ever deal after a year and the monetary reward he got made the wait truly worth it! Scott Dalinger is a part-time rhino from Portland, Oregon. After discovering wholesaling by accident, he decided to give it a try. While he didn’t follow a proven system when he first started, things changed dramatically after he joined the tribe. 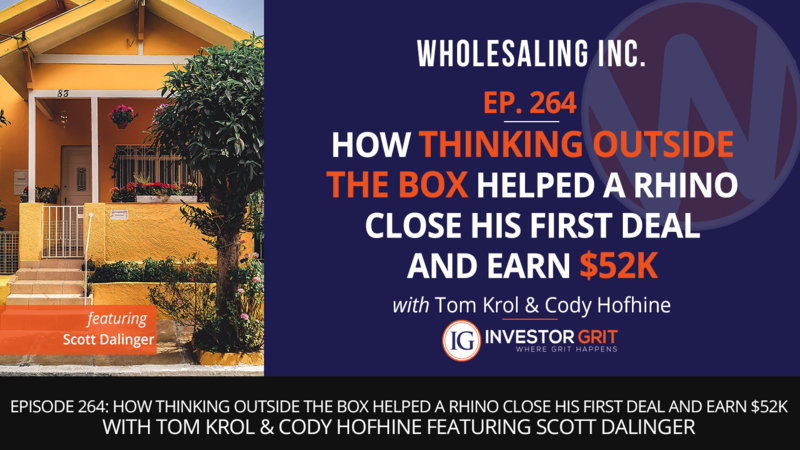 Fortunately, applying the Wholesaling Inc. strategies, cultivating the right mindset, and thinking outside the box have made a world of difference for him. And while his first deal didn’t come as soon as he would have wanted, he learned a lot of valuable lessons and was rewarded handsomely for his efforts. If you need a lesson in persistence, thinking outside of the box, and developing the right mindset, today’s episode is exactly what you need to hear! While he was able to build amazing rapport with the prospect right away, he was not able to close the deal right there and then. However, Scott still kept in touch and made consistent follow ups. After going the extra mile of thinking outside of the box to help seller with her concerns, he was able to eventually close the deal. Scott bought the contract for $165,000 and was offered $217,000. That’s $52,000 reward for the extraordinary help and service he provided!